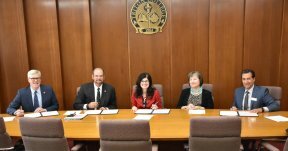 A newly signed agreement between Triton College and University of Illinois-Chicago will allow Triton students to easily transfer credits to nearby UIC, where they can complete their baccalaureate degrees. Officials from Triton and UIC gathered at Triton’s River Grove campus Friday Aug. 25 to sign the Transfer Admission Guarantee (TAG) Program agreement, which will benefit students from throughout the Chicagoland area and beyond. Under the partnership, Triton students who successfully complete required TAG Program courses and meet other criteria will be guaranteed admission into UIC, allowing them to build upon their experience at Triton and minimize the duplication of instruction. “We are pleased to offer our students the opportunity to enroll in the TAG Program, which fosters our mission of student success by allowing Triton graduates to complete their Baccalaureate degrees at UIC,” said Triton College President Mary-Rita Moore. As students at Triton College, TAG Program participants will be assigned a Transfer Coordinator who will work with them to ensure they remain on track to successfully complete the program. Additionally, students will have access to an online account that keeps them engaged and informed by allowing them track their progress, helping to ensure they reach their educational goals. Students can enroll in classes taught on Triton’s conveniently located campus which features cutting-edge equipment and state-of-the-art facilities, or take advantage of online programs that allow students to study from anywhere. To learn more about the Triton College – University of Illinois-Chicago TAG Program, visit www.tag.uic.edu. Photo Cutline: (L-R) University of Illinois-Chicago registrar Robert Dixon, UIC vice provost Kevin Browne, Triton College President Mary-Rita Moore, Triton College vice president of academic affairs Deb Baker and Triton College vice president of student affairs Doug Olson sign the TAG Program agreement at Triton College on Aug. 25.